SWANSEA-MEMORIES ARE MADE OF THIS! Time was when if you wanted to go anywhere in Swansea you went with The Transport. South Wales Transport to be precise, the bus company that carried the people of Swansea far and wide. Many will remember streets filled with big maroon coloured double-deckers like those at Swansea Bus Museum just off Fabian Way. Well, to make sure those vehicles gave their best service there was a highly skilled team of engineers. 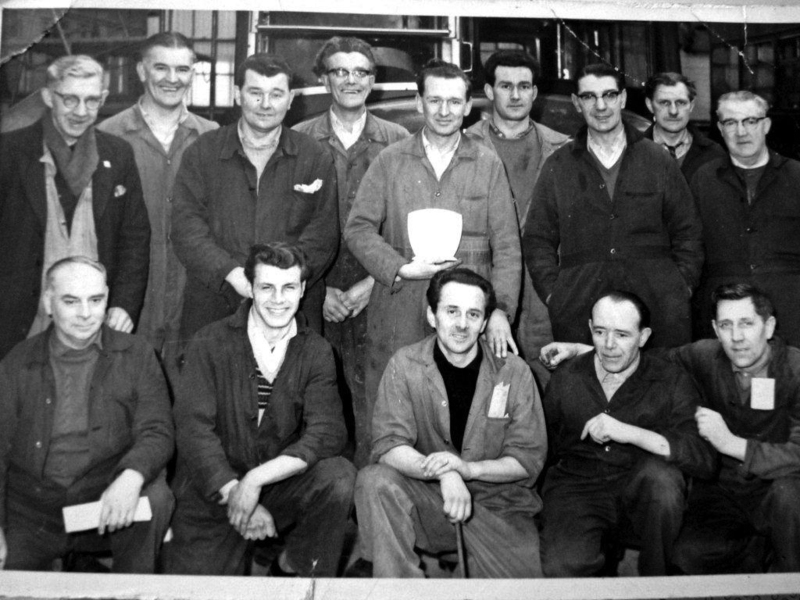 Some of them are seen here (right) at a retirement function to say farewell to one of their colleagues back in the early 1960s. 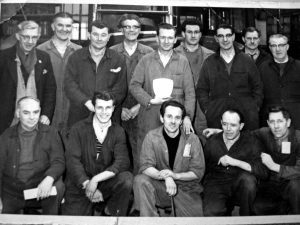 The picture is just one of the many snapshots in time to be found in the 18th book in consecutive years to result from the picture gathering of former Swansea journalist, author and publisher David Roberts. The arrival of his books has long become a date of its own to look forward to in Swansea’s calendar and the latest offering, Swansea – Memories are made of this! won’t disap-point. For details on how to obtain a copy of the book, visit www.bryngoldbooks.com or phone 01639 643961. David is now compiling this year’s volume, the 19th, which will be on sale at the beginning of September. Watch out for more details in TheBAY. The Wildflower/Wellbeing Garden planned for Singleton Park is to proceed after £50,000 funding received from CORY Environmental Trust. Pamela Morgan, Chairman of the Friends of the City of Swansea Botanical Complex has confirmed that the above project can now proceed. Pamela commented We at the “Friends” are delighted to be awarded this grant as it means they are now half way to securing the £100,000 they need to develop the new area. Fencing will be installed within the next month or two and with a contribution of £25,000 from their own funds, the pathways and seating should be in place by the end of the year. The area will be a natural, and more informal garden than the existing garden; plants will be selected for a succession of blooms throughout the growing season. A carpet of bluebells will be planted in the woodland area, wildflower seeds scattered throughout the area will be specifically chosen to attract butterflies and bees. FCSBC are now seeking further funding for phase two of the project which will include the cost of bespoke entrance gates depicting wildflowers and grasses, hexagonal seating, as well as all the wildflower seeds, bulbs and other planting. A huge thank you to all the local community and organ-isations that have helped so far with contributions, letters of support and signatures on the support surveys. Wildflowers are at their best in July – keep an eye out for Catsear, Clover, Trefoils, Speedwell, Herb Robert and Meadowsweet. Insects are also at their busiest and butterflies at their best. And then there’s the beautiful blue dragon and damsel flies (can you tell the difference? Look at the wings). Unfortunately, it’s also the time when midges, flies and wasps start to become a nuisance. All this fine, warm weather has meant the river is rather dry and on the low side. This in turn, has meant that the waterwheel isn’t always turning because there just hasn’t been enough water (the waterfall always takes priority). After some rain (and a decent amount at that) has fallen, they are hoping to get it back on again. For further info or to find out if Europe’s largest generating waterwheel is turning, please call (01639) 636674. Every day during the summer holidays there will be self led activities from the National Trust’s “50 things to do before you’re 11¾” campaign. Children can pick up a scrapbook from reception and take part in a number of fun activities, from bird watching and bug hunting to Pooh sticks and tree exploring. Just ask a member of the team on arrival. Ella is 9 and attends Gowerton Primary School. 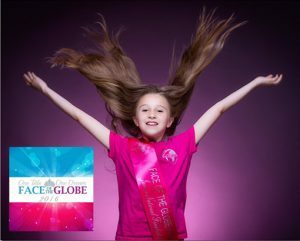 She is taking part in Face of the Globe 2017 which is an international beauty pageant. It is natural beauty so no fake tan, makeup, hair extensions, high heels for under 11 age groups. The national finals take place in the Celtic Manor Hotel on 18th September 2016 where Team Wales will be selected. The team will consist of 5 girls from each age group. Once selected they will have the opportunity to compete in the International Grand finals held in Disneyland Paris in March 2017 where Ella hopes to get to sing on the Disneyland stage, as this is her dream. She was lucky enough to secure the role of young Shrek and Grumpy in the professional West End touring production of Shrek the Musical in the Wales Millennium Centre last year. So she is going from an ogre in a swamp to a princess in a castle if she achieves her goal of making it to Team Wales and Disneyland Paris. 400% rise in wipes on beaches is putting marine life at risk – and pushing up your bills. We all love a wet wipe. Baby wipes, wipes to get rid of make-up, fake tan wipes, our bathrooms are full of them. But instead of ending up in the bin when they’re finished with – millions are being put down the loo because of consumer confusion. That’s because some are labelled flushable, some biodegradable and some need you to read every bit of the small print which most of us can’t be bothered to do. But the truth is, even those labelled flushable are failing to meet the water industry standard. The Marine Conservation Society (MCS) has launched a campaign to persuade retailers and manufacturers to clearly label their wet wipe products with a ‘DON’T FLUSH’ message on their packaging so they go in the bin, not down the loo. Flushed wet wipes are a nightmare. It only takes a few to clog up your drains and when they team up with fats and oils they create massive fatbergs in the public sewers – which can be as big as a bus! The average cost to sorting out a wet wipe blockage is around £66. Water companies say there are over 366,000 sewer blockages throughout the UK every year, of which between 50% and 80% are caused by fats, oils and grease, wipes, sanitary waste and other un-flushable items. Those figures have resulted in about £88 million being spent annually on sorting out the blockages – costs that will be paid for through higher customer bills. But wet wipes also pose a massive threat to marine life. Containing plastic, these squares never go away – they just get slowly broken down and become micro-plastics which are then ingested. Organisms negatively impacted by ingesting micro-plastic range from the small zooplankton to larger marine animals such as fin whales and they’ve been found in mussels heading for human consumption. A stalwart friend of TheBAY, Ann Jones MBE has received yet another honour, presented to her in the House of Lords! 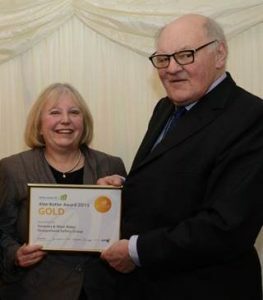 Ann is the secretary of the Swansea Safety Group; through her hard work and organising ability RoSPA gave the Group a Gold Award for their excellent work in the field of occupational safety and health. Ann was delighted at this wonderful opportunity to visit the Houses of Parliament and to have lunch on the Terrace, the House of Lords restaurant over-looking the Thames. Ann reports that the visit started with a tour of the Houses of Parliament, from Westminster Hall through St Stephens Chapel to the Central Lobby. “This is graced by many statues including one of Margaret Thatcher with her handbag!” adds Ann. “It is where you see reports of parliamentary activities on the TV news. From here the House of Lords is to the right and the House of Commons to the left. “And so to the restaurant. The master of ceremonies welcomed the guests with a good morning. As it was now after midday, we were somewhat bemused, till he explained that in the Lords, it is morning until the house sits. That day it was sitting at 2.30pm! Nice one, Ann! Swansea is proud of you as ever……. Yes, Please No by Swansea mother Lynn Coleman takes the form of a letter to her 30 year old autistic son Neil. It attempts to tell him the story of his life, how special he is and how much he means to his family. The book also aims to support other parents who are reaching this difficult time in their son or daughter’s life – the dilemma of letting go or not. The emotional turmoil that they are experiencing due to the knowledge that their son or daughter is no longer physically a child and should be joining the adult world, but very aware that emotionally and mentally they are still children.